It is noteworthy that, before 1956, the Renewal of Baptismal Promises was never part of the official liturgy of the Roman Rite, but only a semi-private “para-liturgy” conducted among special groups in retreats, missions, anniversaries of one’s Baptism and at the First Communion of children. An important factor is that these ceremonies were introduced on the initiative of individual pastors at the local level. Not all of them were performed in church. There was no set formula of words. And as their occurrence was only sporadic, they did not constitute anything approaching a universal custom. When the Renewal of Baptismal Promises was first introduced experimentally at the Easter Vigil in 1951, it was presented as an ancient liturgical tradition that had fallen into disuse and needed to be restored. But, like so many of the reformers’ spurious claims of liturgical “restoration,” the historical basis for this claim is tenuous and lacking in contextual detail. But his objections were brushed aside, and the new Vigil went ahead on an experimental basis in 1951 with the approval of Pius XII, before being imposed universally in 1956. The ritual is conducted in both the Protestant and revised Catholic liturgies on similar lines. The Bishop or priest faces the people, gives a short address and conducts a “dialogue” in the vernacular with the whole congregation. It is not surprising, therefore, that this ceremony, alien to any Catholic concept of the lex credendi, would clash egregiously with the lex orandi. This is glaringly obvious both in its outward form and in its ambiguous theological import. 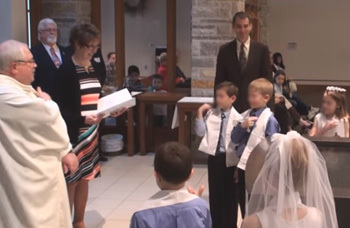 This was the first time in the History of the Church that a ceremony of Protestant inspiration and ethos was officially incorporated into the liturgy, but, as the Novus Ordo would amply demonstrate, it was not the last. Fr. Antonelli explained that the Renewal was among those practices “to be restored if their reintroduction would truly render the rites more pure and more intelligible to the minds of the faithful.” (8) But, how intelligible is it? And what exactly is renewed? We need to consider and ask: In what sense can one “renew” permanent vows as distinct from temporary vows that can be renewed periodically? To do so liturgically could easily give the impression that Baptism is ephemeral, as if the original vows had passed their expiry date and needed to be, as it were, “topped up” for another year. It makes sense to recall our baptismal vows, to ponder how far we have fallen short of them, as the Catechism of the Council of Trent recommended, (9) to reaffirm our adherence to the Faith, and to renew our efforts to progress in the spiritual life with the aid of the Mass and the Sacraments. That much is crystal clear. What is not so clear is the term “Renewal” of Baptismal Promises. It may be interpreted in the traditional sense outlined above, but it is potentially dangerous in its lack of precision, rendering it unsuitable for inclusion in the liturgy. For, Baptism is the renewal, whereby one goes into the church unbaptized and comes out a Christian. One can never be in that unique position again and, although baptismal grace can be lost, the force of the original vows remains unchanged. They cannot, therefore, be said to stand in need of renewal. 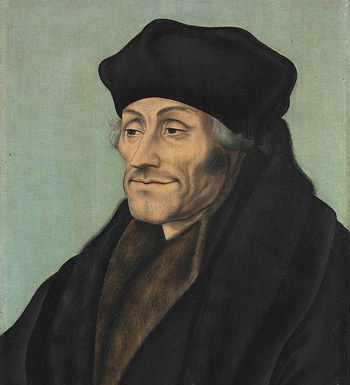 Noël Beda was head of the Theology Faculty in Paris and used Scholastic theology to defend the Faith against the errors of the nascent Protestant “Reformation.” Erasmus, on the other hand, had little regard for precision in religious matters and held Scholasticism in contempt. In 1948, the Commission included in its “Memo”, n. 74, a proposal for the Renewal of Baptismal Promises to be elaborated by a sub-commission and submitted to the Pope for his approval. As early as the 1920s, Dom Virgil Michel, O.S.B., reputedly the “father of the Liturgical Movement in the USA," had designed a ritual for the Renewal of Baptismal Promises, which he described in ‘Baptism Consciousness,’ Orate Fratres, 1, 1927, pp. 309-313; Dom Godfrey Diekmann, O.S.B., further promoted the ceremony during the First National Liturgical Week at Chicago 1940. B. Capelle, Memoria, Supplemento II, 1950, pp. 21-22. Paul F. Bradshaw, New SCM Dictionary of Liturgy and Worship, SCM Press, 2002, p. 52. Memoria sulla reforma liturgica: Supplemento II – Annotazioni alla “Memoria”, n. 76, 1950, p. 9.